Porterville, Kapa Bodikela. Top left: main church. Top right: A 'China Shop' in town. Left center: Historic town house. Bottom: A view of the town's main road. 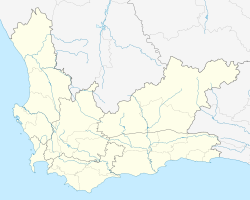 Porterville ke toropo wa Mmušôgaê wa Bergrivier, Mmasepala Setereke tša West Coast go feta profense Kapa Bodikela ka moka Afrika Borwa. ↑ 1.0 1.1 1.2 1.3 "Main Place Porterville". Census 2011. Letlakala le fetotšwe la mafelelo ka 17:02, 1 Lewedi 2017.